Today, August 10, 2017, according to the lunar-solar calendar of the ancient Vedic civilization of India and Nepal, is “A Day for Fulfillment of Women’s Desires”, especially with regard to marriage. The festive day is known variously as Kajjali (or Kajari) Teej, Badi Teej, and Krishna Paksha Tritiya. Married women keep a fast today for the well-being of their husbands, while unmarried women keep a fast to be blessed with a suitable spouse. Special thanksgiving offerings are made as part of personal, household, and communal puja ceremonies, and blessings are requested on this day, particularly from Lord Shiva and His Divine Consort, Parvati. Lord Shiva is understood as the Personification of Eternal Inward Silence, in the sense of the fully awakened Unbounded Consciousness, resting in Its own transcendental serene nature at the source of thought, the innermost depth of the mind. Shiva is revered both as the perfect Yogi and the perfect Husband. His Divine Consort Parvati is said to be the daughter of Hima, God of the Himalaya Mountains (Hima, God of Eternal Snow + alaya, abode). Goddess Parvati is a personification of the Wholeness of Reality (Brahman) in Its manifest form of Adi Chit-Shakti, primordial conscious energy. Parvati is understood as simultaneously Shiva’s spouse or consort, His better half, literally the “better” (compassionate, feminine, nurturing maternal) half of His own boundless perfect Self-nature, and as the form of the Divine Goddess toward whom his love is like that of a servant or child to its mother and teacher. In a divine sense which transcends all human relations, Shiva is at once the masculine aspect of Parvati, the transcendental unmanifest consciousness (creative intelligence) aspect to Her manifest conscious energy aspect, Her inner Self, Her brother, Her best friend/boon companion, Her husband, Her son, Her God, and Her devotee. According to Vedic tradition, the ideals of each of these sorts of loving relationships are to be aspired to in the life of each individual. Especially this is admired and aspired to in regard to the unconditional love to be mutually enjoyed, cultivated and respected between spouses: both are at times to care and nurture one another as if mother or father to child and child to parent, as brother to sister, as friend to best friend, as sweetheart-spouse to spouse, as teacher to student and student to teacher, as devotee to God or Goddess and as God or Goddess to devotee, etc. 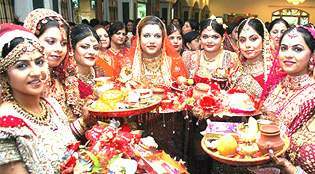 On this day each year, married women aspire to fast, pray, and perform various thanksgiving ritual ceremonies (pujas) and make various vows and intentions (sankalpas) for the sake of aspiring to and being blessed with successful fulfillment of evolutionary desire, particularly with regard to happy marriage and the well-being of their husbands. Single women similarly observe the same vrats (fasts and dedications) for the sake of gaining a future suitable ideal spouse and happy fulfilling married life. In the case of women uninterested in marriage, or otherwise outside of a marriage life-path, most of the same observances are upheld with regard to their children, parents, siblings, friends, teachers and students, etc. It is believed by those who maintain a traditional Vedic lifestyle that by a woman keeping a fast on this day, she helps ensure the longevity, health, inner freedom and happiness of her husband or future husband. A particular aspect to the reverence and devotion shown to Goddess Parvati and Lord Shiva and as welcoming of the arrival of the monsoon season is to utilize sprigs and leaves of the neem tree. Neem is one of the most powerful herbs utilized in ancient Vedic medicine (Ayurveda). On this day, the combined Divine Consciousness and Energy of Shiva/Parvati is invoked and felt to become especially infused into and manifest as the medicial virtues of the neem tree. Sprigs of neem are cut and enshrined on special altars and pujastans on this day and the leaves of neem are used in special offerings made on this holy festival day. Also on this day, married women visit their parents’ home. 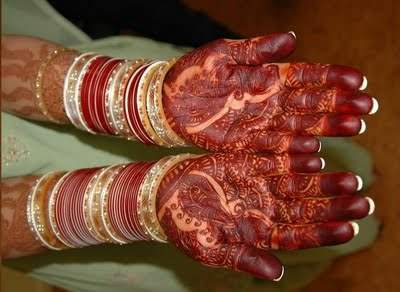 “Women dress up in their best attire including all the Shringara items, — namely, bangles, Kajal (an Ayurvedic medicinal collyrium form of kohl, black eyeliner), Mehendi (intricate temporary “tattoo-like” decorative designs traced with henna paste on hands and feet), and Bindi (symbolic third-eye mark on forehead).” Newlywed wives, especially, visit their parents’ home on the first Kajjali festival of their new life. In many yards, swings are hung and all the women gathered at the households and neighborhoods enjoy celebrating the advent of monsoon by playing on the swings. An extensive collection of traditional age-old folk songs are sung on the holiday. Many of these songs memorialize the separation and love-longing of an ancient forest queen whose saintly kingly husband had suddenly died unexpectedly. The couple had lived in a forest known as Kajjal which has given its name to the holiday as well as to the Ayurvedic eye medicine and beneficial cosmetic made of various herbs and minerals which is said to have originated from this forest. The songs also celebrate the arrival of the monsoon rains as bringing coolness and relief to the grieving forest widow queen, and to all who mourn their separation from their beloved. Kajjal holy day also celebrates the devotional longing of Parvati (She who is born of the Mountain, ie Himalayas) for her future husband Shiva. Shiva’s previous wife had died and Shiva went into mourning by practicing the total silence of deep meditation in an ice cave in the Himalaya. Parvati observed an intensive fast and other devotional observances (tapas, austerities) for the sake of gaining the ideal husband of her choice – no less than God Himself in the form of the perfect Yogi, Shiva. After over a century of unbroken devotion, Parvati’s dedication at least awakened Shiva from the silence of his samadhi of restorative mourning honoring the loss of his first wife. Drawn out of his meditative absorption by the dedicated love-longing focus of Parvati, the Divine Couple were united in marriage. Of course, as the Personification of the Divine Energy manifesting as the universe, or the eternal Mother Shakti, Parvati is also a “rebirth” or reincarnation of Shiva’s first wife Dakshayani, or Sati (She who is Sat, eternal Truth or absolute Being). So this holiday also celebrates the reuniting of the cosmic love forces of Unmanifest and manifest Nature — the union of the Divine Feminine and Masculine in the natural world and within each individual as also represented and celebrated in the unconditional mutual love of every ideally married couple. Happy Kajjali Tritiya! May all your love-longings and other wholesome desires find fulfillment!